I just got more junk mail from Jenner reminding me of when I brought my 2010 Sierra in last year for an oil leak. The service man wasnt sure if it would be covered under the warranty but promised to call me in an hour after they had a look. Though the mileage was 44,000 we agreed that they could perform a 50,000K fluid change service at the same time. I went for a walk. 2 hours later I hadnt heard a thing so I called him. I was told this would all take 2 - 3 hours and warranty would cover a new seal. I would pay for the 50K service. OK. In the end it took all day. If Id known I would have made arrangements to have been picked up. My cost for the 50K service was $750.oo Ouch. Bad form. 1. These guys know exactly how long this work takes. Or they should. They do it all the time. I should have been told straight up. 2. A phone call up date would have been so easy. I shouldnt need to call them. 3. A ball park estimate of the cost of a 50k fluid change service should have been mentioned so that I need not have the $700 shock when I picked it up. 4. I received no follow up call asking how I enjoyed my service experience. (Probably just as well, it wouldnt have been pretty. I will not go back to Jenner. Jenner Chevrolet gave us the run around for months, they tried fixing our vehicle over and over again and each time we brought it home it would break down and have to be towed back to Jenner the same day. They said they fixed it, and charged us a large sum of money for a part that they said was not covered under warrenty. We finally gave up after the fourth break down, and took it to Dave Wheaton in Victoria. They told us the part we payed for WAS covered under warrenty, we found out later Jenner DID claim it under warrenty but also CHARGED US FOR IT. They then denied doing this, luckly we kept all our papers, it still took us over two months to receive our money back, and about 15 phone calls to GM head office (also VERY unhelpful, they didnt believe us that this had happened!) and Jenner. They also lied to us and asked us for our papers proving the mistake they made, they said they needed to photocopy them. Then they returned to the counter with HALF the papers we gave them and tried to say we didnt give them to them! HORRIBLE HORRIBLE HORRIBLE SERVICE. Came to Jenner with my mom for some recalls on her Acadia, was really dissapointed by the service. They had quoted it would take "a couple hour" and it took almost the whole day, over 4 hours... I understand these things can run longer than anticipated but it made for a huge inconvenience and there was little acknowledgement of this. They never offered to give us a ride anywhere or lend a courtesy car. It was pouring raining my mom is in her 50s.If it is going to take 2-5 hours let us know that, I dont mind waiting but I would like to be prepared for a 5 hour wait ahead of time. Again, it would be different if they were not aware of the recall lists that needed to be done but they were and if you are not sure give us a better idea than "a couple of hours" he even said there was no suprises so why we were not prepared appropriate ahead of time is beyond me... the service guy was nice but that really didnt make up for it. Bought a truck from here in October of 2014. Both salespeople I dealt with fit the stereotype - pushy, talked a lot but didnt say much and didnt actually have a lot of knowledge of the product (Could not figure out how to operate or activate OnStar or program the radio and couldnt track down a manual). 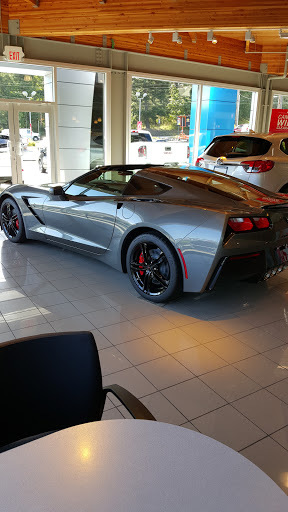 I really liked the truck but they werent open to negotiating on price at all until I showed them an offer from another dealership for a comparable. The truck had a sensor broken and it was supposed to be fixed when I picked it up, but it wasnt. It took four months of follow up to finally get them to arrange to fix it. Having said all that, the inspection report they gave me on the vehicle was true to the condition of the vehicle and Ive had no issues since I bought it. Just bought a new truck here. Salesman (Ali Zeidan) was super friendly,helpful and not pushy at all. Answered all my questions honestly and was very knowledgeable of what to keep a close eye on regarding future maintenance. He was a little mistaken on some of the features that my truck had, which was a little disappointing to find out after the fact but not a big deal. Financial associate (forgot his name) was informative and not overly pushy regarding warranties etc. Sales Manager (Chris Carr) was very helpful in arranging the smooth transition of buying out my existing lease. Also engaged with me over email outside of regular work hours. Overall a great experience and a big thank you to all the staff that helped me. I will recommend to friends for sure. This was my first new car, although I have bought plenty of used ones at dealerships. My wife and I bought a new Saturn just before they were discontinued. We have dealt with Baljet and Wheaton, and where somewhat less than impressed with either. Jenner has excellent sales and finance people. They made us right at home. I have been getting parts from Bill and Peter in Parts for years. They know their products front and back, new and old, very, very well. The service people often can get me in on a drop in basis, which is helpful. We never had a warranty claim problem with our Saturn with Jenner, and so far, no troubles with the new Cruze. If you are thinking of buying a GM on the island, I would recommend that you start at Jenner.